Last night we reported that Google had stripped all references and links to the free version of Google Apps from the landing page for the product. New users had just one option – to sign up for the Premier version and pay $50 per user per year after a 14 day free trial. Translation: they are trying to get more users to pay by making the Standard version harder to find. In that they succeeded brilliantly, but were obviously a little overzealous in hiding it. 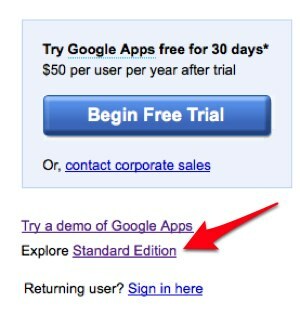 Google just emailed to say that a link to the Standard version has been added back to the landing page. And they reiterate that they have no plans to kill the product, they’ll just make users play a version of Where’s Waldo to find it. (Ok, they didn’t really say that last part about Waldo).